As women’s fashion week kicks off in London, there’s fresh talk of the clunkiness of the fashion calendar in a digital world, the exorbitant expense of traditional fashion shows and the difficulty of keeping up with an industry that’s in flux. But as much as fashion’s changing, there’s still one constant: trends. Sure, see-now, buy-now strategies (as adopted by big-money brands like Burberry and Ralph Lauren) and the ever-expanding high street (and its ability to turn product from concept to reality in just a couple of weeks) might seem like forces killing off trends’ ‘bedding-in’ time, but the reality is, no matter how much product we’re flogged, no matter if it’s debuted on a runway or in a sponsored slot on a celebrity’s Instagram, trends will still stick – and nowhere more so than in menswear (spot some of the familiar trends from the last couple of seasons below). We’ve lost count the number of times shearling has topped trend lists in recent seasons. Its continued popularity this autumn/winter is at least in part due to the slow trajectory of men’s fashion trends in general, but a lot to do with the fact that – since re-discovering it for the first time since the late 1970s – we’re seeing it as less a trend, more a winter perennial. On the runways, classic flight jackets were out in full force at Tiger of Sweden and Gieves & Hawkes, but it was the reversed shearling takes at Belstaff and Coach that drove this trend forwards. Take your pick, but make sure you’ve got one of these – or a less expensive, less sheep-harming faux shearling jacket – in your wardrobe this season. Are checks the new stripes? Forgive the fashionism, but if the autumn/winter 2016 shows were anything to go by, stripes might slowly be surrendering their status as the most versatile, put-it-across-everything menswear pattern out there. How so? Well, this season saw checks take new territory, namely athleisure. While checked tailoring and outerwear have been trending at top tailoring houses for a few seasons (and continue to at the likes of Bottega Veneta and Brioni), the pattern hasn’t until now been given styling treatment that skews more sporty than sartorial. Some of sports luxe biggest proponents, including Alexander Wang and Pyer Moss, mixed gingham and windowpane checks in amongst striped sportswear separates and printed hoodies in their AW16 shows – proof that this pattern’s not just one for parlour games. 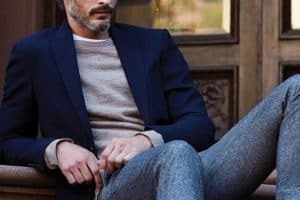 Maybe it’s designers’ current nostalgia for the early 1980s (thanks, Stranger Things), or maybe it’s just that – in an industry dominated by leisurewear – designers are proffering the duffle coat as a warming alternative to the tailored overcoat, something that sits somewhere between a bomber and a Chesterfield on the formality scale. Like a lot of menswear, the duffle has its roots in the army barracks, but AW16 looks from Saint Laurent and Dior Homme took the outerwear classic to a grungier place (in the best way possible of course), flanking it with shaggy hair, distressed denim and creepers. We’re not saying it’s time to trade in your coat just yet, but if you’ve been looking for an alternative to the same old, look to this old favourite. It all started with Yeezy. While some of fashion’s tastemakers dismissed Kanye’s stab at luxury fashion as just another headline-grabbing gimmick, the rest of the industry lost no time in doing the right thing: ripping the collection off. Testament to just how ‘key’ this colour palette is, the likes of ASOS have already started blasting out entire promotional emails dedicated to earth tones – chock full of clobber (from smart to casual) in colours like clay, copper, moss, russet and sand. It’s a move on from the head-to-toe tonal grey looks that dominated this time last year, and thankfully a lot easier to execute – allowing you to mix up different colours rather than rely on very subtly different tones of the same colour. Menswear’s looking tough this season. As much as Gucci’s 1970s flounce and Saint Laurent’s Bowie-inspired androgyny are flowering, there’s a faction of brands that still prize function – or at least a suggestion of it – over form. Which is why outerwear at Belstaff and Casely-Hayford was replete with pockets (following on from summer’s field jacket fixation), tailoring came layered with gilets at Brunello Cucinelli and why straps, badges and zips were spread through Versace’s space-themed collection. What does that mean for your wardrobe? Look for pieces that wouldn’t look out of place on a tour duty. Or a space mission. Ask most #menswear devotees where the trend for zip-up tracksuit tops worn under tailoring came from, and they’ll say Burberry. But this high-low styling contrast has been bubbling to the surface over several seasons. First, there was Lanvin, whose SS16 show featured a look that teamed a luxe, dark tan take on the track top with a pair of tailored trousers. And AMI, whose SS16 flouro mint green jacket was layered underneath a black and white pinstripe suit. Then, of course, there was Burberry, who for AW16 styled track tops in the style of Ben Stiller in The Royal Tenenbaums with its heritage tailored outerwear. Now, there’s everyone else – from BooHoo to Reiss. Layer up a funnel neck style under a light wool suit this season or stick with last year’s gilet move which is still holding strong.